RockDove Solutions (RDS) is looking for a high energy, intelligent Regional Sales Manager with strong verbal reasoning skills. Are you looking for a place where you can make a difference? 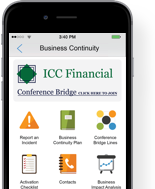 Join an organization that helps institutions and its employees prepare and respond to a crisis with its award winning enterprise mobile app, In Case of Crisis. As a high growth company selling into a diverse market, RDS embraces a collaborative culture and flexible work setting. We are committed to and have built a client base of raving fans. We are always searching for highly motivated employees. So even if we don’t currently have an opening, send us your resume and we will be in touch!